Lyn Anderson, of Newark, DE, has a problem. So does George Cope of nearby Landenberg, PA, and they hope others have it, too. There are stories locked in their brains – just itching to get out. And they want to get these stories out of their heads and onto a stage; preferably the stage at the Chapel Street Players theater at 27 North Chapel Street in Newark. Not only that, but they hope the condition is contagious and other people with stories locked in their heads will join them every third Saturday. “Absolutely no prior experience is necessary,” said Ms. Anderson. That’s kind of the mantra for the group calling themselves CSP NEXT — No experience required, just tell a story. As anyone can guess, CSP stands Chapel Street Players; NEXT, on the other hand, is not an acronym – just a word in all CAPS. “It just means the next play, the next idea,” Mr. cope said. NEXT fluctuates in members on any given Saturday; as few as four and as many as 10 or so have attended. And it is not just writers. Local actors from CSP lend their immense skills to give the new works some life. Every month the writers bring their work and the actors read the pieces. 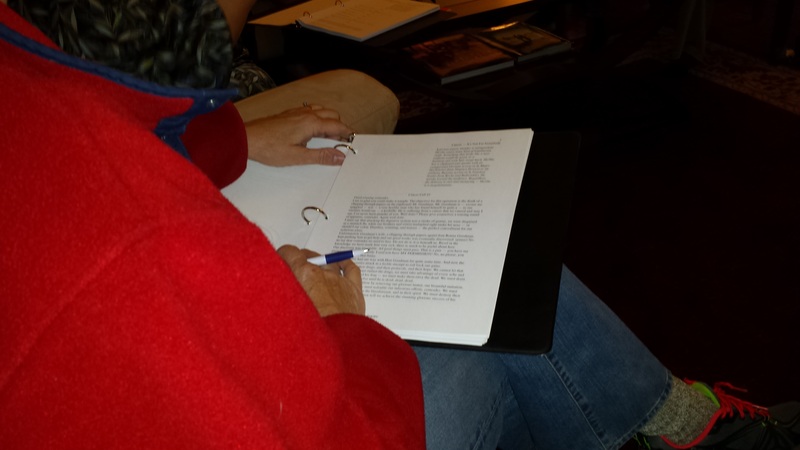 Hearing someone else read the scripts helps the fledgling playwrights make corrections and improvements. It is also a win-win for actors, said long time actor Brooks Black. “I like any chance I can find to act and work on my craft,” she said. “NEXT is a laid back atmosphere. Getting NEXT off the ground needed the support of the community theater’s board of directors and Judy David, CSP’s vice president of programing became the liaison. NEXT definitely has a place in the theater’s activities, she said. 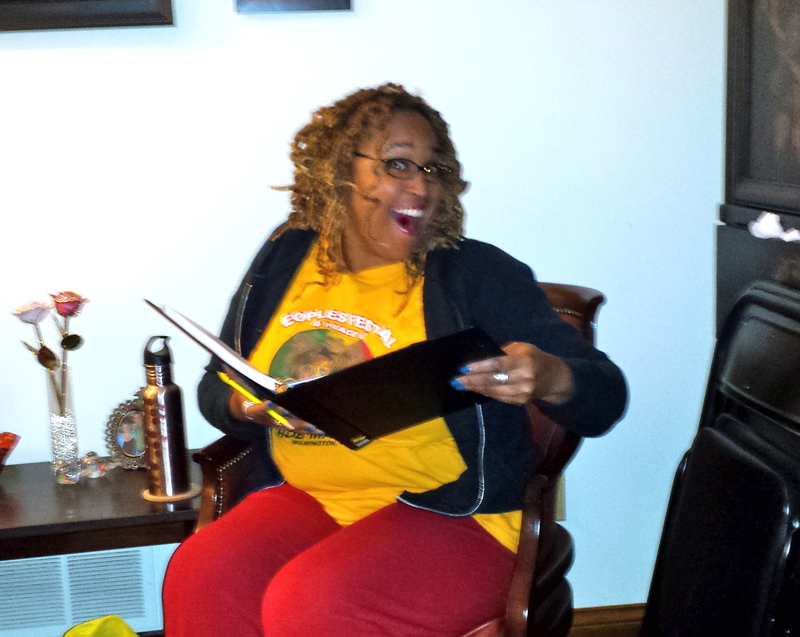 “We are Newark’s official community theater and we take that seriously,” Ms. David said. “And theater starts with the playwright. The board of directors agreed with Ms. David and NEXT uses the theater for two hours once a month. “Anything we get done, or create is partially the board’s doing,” said Ms. Anderson. For NEXT to get better, they would like to get more people involved. “This is a safe wonderful environment,” Ms. Anderson said. “Anyone with an idea is welcome. Mr. Cope agrees, saying the smallest incident can spark a play. “It’s all about starting with nothing or nearly nothing,” he said. “It could be a personal experience, a casual comment by a friend, a line from a poem or a book – and then surrounding that germ of an idea with imaginary characters and encouraging their story to grow. So as NEXT grows and more people afflicted with stories to tell, find about it, CSP might have a ready supply of homegrown talent. And that’s okay with Ms. David. “CSP has done a lot of original works over the years and there is something special about being the first to do a play,” she said.